Arrayanes pictures take you to the renowned myrtles forest, home of centenary trees declared as the Arrayanes National Park and natural monument in the Bariloche lake district. The Parque National Los Arrayanes is located on the Quetrihué Peninsula in the Bariloche Lake District. The arrayanes forest occupies the southern part of the peninsula with an access by boat from Puerto Pañuelo (Bariloche) to Quetri Hue Harbor at the entrance to the forest or by the 12 km (7 miles) trail from the Villa la Angostura. In any case visit to the Arrayanes National Park it is a whole day trip because the boat tour stops also at Victoria Island where you will spend few more hours. Given that fact it seems that the walking tour along the peninsula is more rewarding – offering not only beautiful vistas on the lake and surrounding mountains but also a chance to spot exotic birds, native animals and examples of rich flora – be it trees or flowers. But for sure this is not the main reason to visit the Arrayanes National Park – it is the arrayanes forest itself at the southern tip of the island. The Free Arrayanes Pictures can make it possible for you by bringing this mysterious forest to your home. 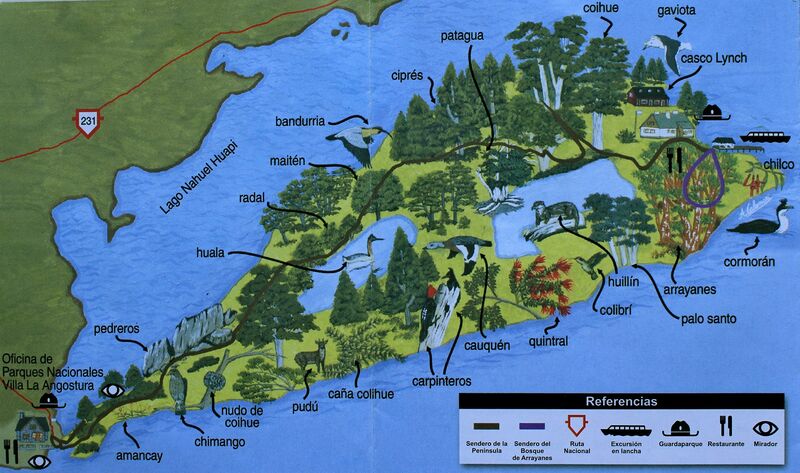 Free Arrayanes Pictures: Map of the Quetrihué Peninsula declared as the Parque Nacional Los Arrayanes. Please click on the picture to download its high resolution version! The nice wooden boardwalk will take you along the Arrayanes till the end of the park. More adventurous visitors can opt for a mountain bike tour along the peninsula. While it may sound attractive, let’s face it – biking will considerably limit your personal contact with the nature in this absolutely unique natural reserve. If you insist on mountain biking - you can have excellent (although technically quite difficult) biking trails on Cerro Cathedral – not far from Bariloche. The National Park of Arrayanes was created in 1971 and covers the area of 1793 hectares. It is also unique in a sense that it is a “park within a park” as it is located inside of the National Park Nahuel Huapi (Parque Nacional Nahuel Huapi). Arrayanes or arayan trees belong to the family of myrtles - the category of little known and somehow mystified species may be due to the impact of an old Disney’s fairy-tale movie with an emblematic character Bambi that seems to be taking place in a myrtle forest. Arrayanes - native trees to the Andean part of Patagonia are growing in humid areas of lakes and rivers. In the Bariloche Lake District you can spot several individual myrtle trees here and there without possibly paying attention to them if not aware of their rarity. The uniqueness of the Quetrihué Peninsula comes from the fact that arrayanes form there a dense forest of thousands of trees, totally dominating the flora. Apparently it is the only place in the world where arrayanes form the large forest. Actually the name Quetrihué in the native language of Mapuche (indigenous people of central Chilean and Argentinian Andes) means “place where there are arrayanes”. The forest itself is a mix of young, matured and well aged trees with some apparently having few hundred years if not more (there are speculations that some are up to 650 years old with majority reaching 300 years). Arrayanes grow in a characteristic “family” pattern. The vast area of underground roots of a “parent tree” gives life to several new arrayanes growing in a very close contact altogether, quite often twisted and interleaved with each-other like in an everlasting hug of love. For that reason for some visitors arrayanes may look like gigantic bushes. Arrayan trees are slow-growing but over years they can reach up to 18 meters (56 feet) and trunks up to 50 cm (almost 20 inches) in diameter. Trunks and most branches of arrayan trees are virtually bark-less, covered only by a smooth, tinny, “paper-like” outer layer of cinnamon color with whitish spots. It easily detaches itself in strips revealing lighter inner layers of the same hue. When touching the trunk of arranayans you will feel amazingly low temperature even in the hottest day. In an early summer arrayanes are covered by little white flowers similar to orange blossoms that will give shiny dark-blue fruits with a pleasant taste, visually similar to blackberries. Native people use them for making an alcoholic drink called “chicha”. The evergreen leafs of arrayanes contain some aromatic substances. In the native medicine they were often used for curing digestive and respiratory problems.